The Expedition 48 crew continued researching how living in space affects the eyes and the brain today. Two NASA astronauts also are getting ready for a mid-August spacewalk to install a new docking port. Commander Jeff Williams and cosmonaut Alexey Ovchinin participated in the Fluid Shifts experiment today. They used an ultrasound scan and a tonometer to monitor the fluid pressure in an astronaut’s head and eyes. Microgravity tends to shift fluids to the upper body increasing pressure in the head with some astronauts experiencing vision problems. Williams then joined Flight Engineer Kate Rubins in the U.S. Quest airlock to resize a pair of spacesuits. The duo are scheduled for an Aug. 19 spacewalk to install an International Docking Adapter on the Harmony module. The adapter will be removed from the SpaceX Dragon Aug. 17 during a six-hour robotic maneuver to place it in installation position. The adapters will enable future commercial crew vehicles from Boeing and SpaceX to dock to the International Space Station. 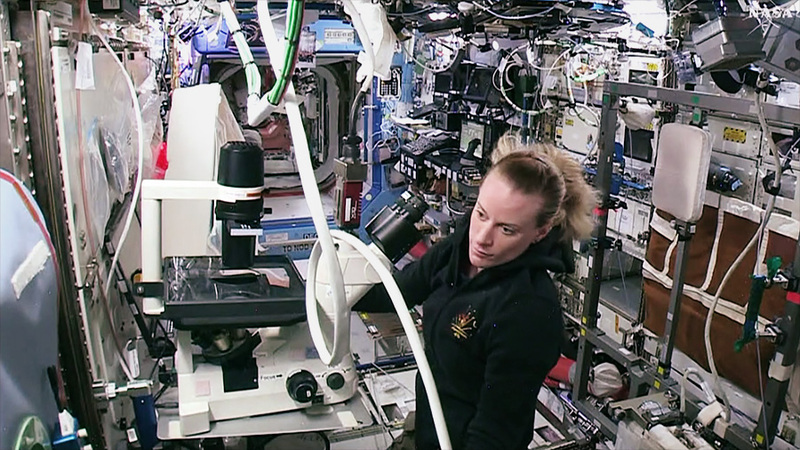 Astronaut Kate Rubins, a biological researcher on Earth, is lifting her science expertise to new heights today setting up a microscope in the U.S. Destiny laboratory module. The new microscope will observe heart cells to help doctors understand how the human heart adapts in space and improve crew health. Expedition 48 is moving ahead with preparations for an upcoming spacewalk. New science also is under way aboard the International Space Station after being delivered last week. A new U.S. spacesuit was unpacked from inside Dragon and will be used during an August spacewalk to install a Commercial Crew docking port. An older U.S. spacesuit will be returned to Earth inside the Dragon for refurbishment. Housed inside the trunk of the Dragon space freighter is the International Docking Adapter. The new docking adapter will be installed to the Harmony module during next month’s spacewalk. It will enable future crew spacecraft from Boeing and SpaceX to dock to the station. The new Heart Cells study got under way last week to observe how heart muscle tissue adapts to microgravity. Another life science experiment, Mouse Epigenetics, is being set up this week to explore how living in space affects gene expression. 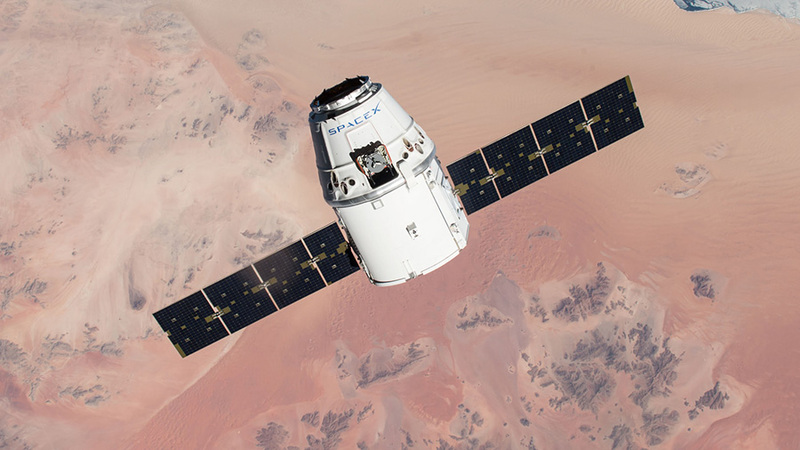 The hardware and mice for both experiments were delivered last week inside Dragon. 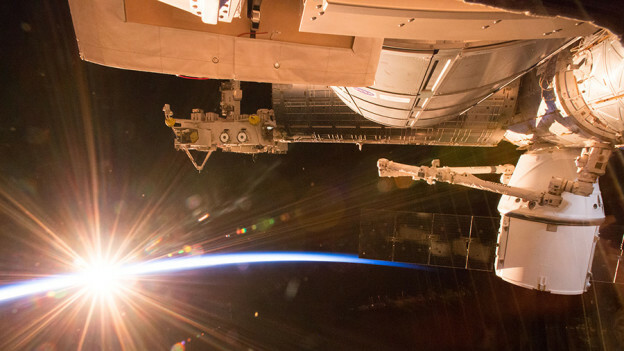 The Sun’s rays illuminate the SpaceX Dragon after it was attached to the International Space Station’s Harmony module. The Expedition 48 crew is beginning work on new science delivered aboard the SpaceX Dragon space freighter. More cargo is also being unloaded from the new Russian Progress 64 resupply ship. NASA astronaut Kate Rubins has begun work on the new Heart Cells study that will observe how heart muscle tissue adapts to microgravity. Rubins also partnered with Japanese astronaut Takuya Onishi for the Body Measures experiment that researches how the body shape changes in outer space. Onishi later setup Mouse Epigenetics gear that will enable research into genetic expression and DNA in mice and their offspring. Commander Jeff Williams worked on plumbing activities in the U.S. segment of the International Space Station. He also worked on biological research hardware before moving on to cargo transfers from the new Dragon cargo craft. Cosmonauts Alexey Ovchinin and Anatoly Ivanishin are unloading gear from the new Progress cargo craft today. The duo also looked at cell cultures for the Kaskad study. Fellow cosmonaut Oleg Skripochka worked on Russian maintenance tasks and joined Ovchinin for the Korrektsiya bone loss study. 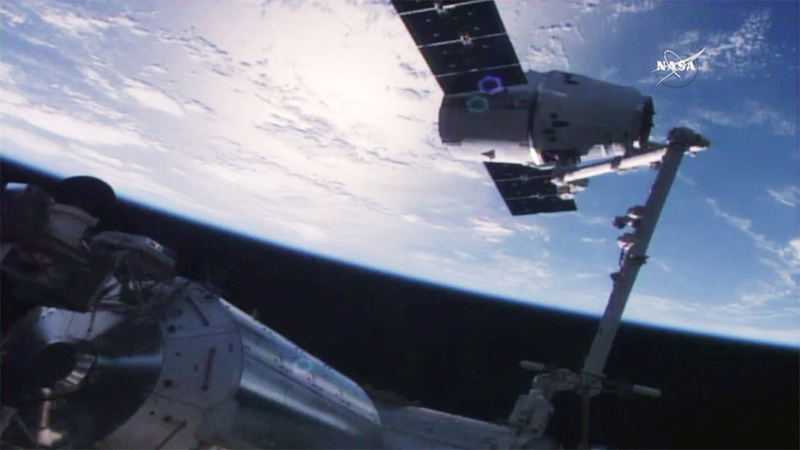 The hatches between Dragon and station were opened at 2:27 p.m. EDT Wednesday, July 20. The crew entered to document the interior and will begin unloading cargo this afternoon. The spacecraft delivered nearly 5,000 pounds of science, hardware and supplies, including instruments to perform the first-ever DNA sequencing in space, and the first of two identical international docking adapters (IDA). The IDAs will provide a means for commercial spacecraft to dock to the station in the near future as part of NASA’s Commercial Crew Program. Dragon is scheduled to depart the space station Aug. 29 when it will return critical science research back to Earth. 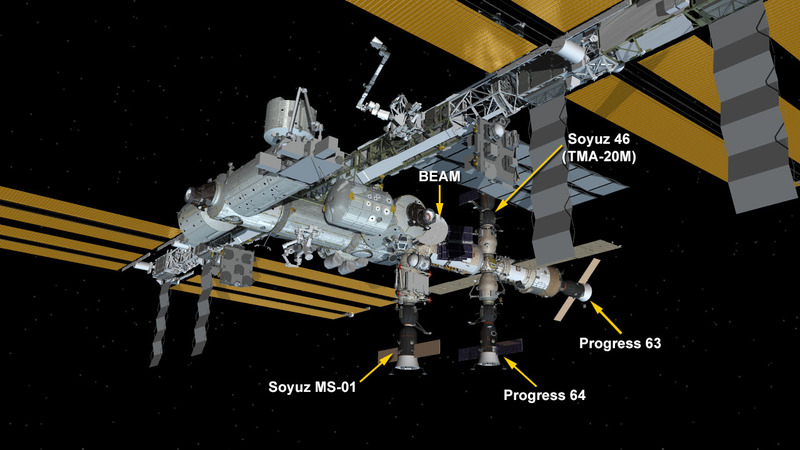 It is the second cargo spacecraft to arrive on station this week. On Monday, July 18, a Russian ISS Progress 64 cargo craft docked to the Pirs docking compartment of the space station at 8:22 p.m., where it will remain for about six months. For more information on the SpaceX CRS-9 mission, visit: https://www.nasa.gov/spacex. For more information about the International Space Station, visit: https://www.nasa.gov/station. 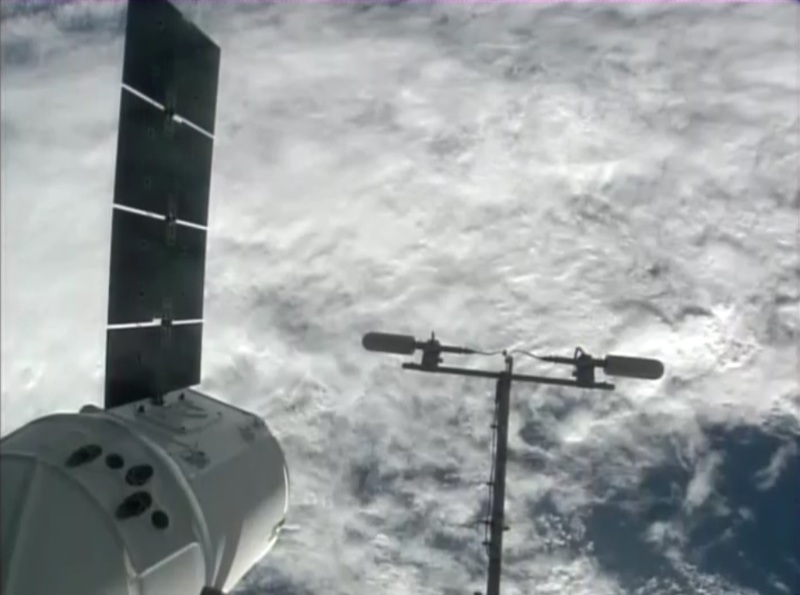 The SpaceX Dragon cargo spacecraft was bolted into place on the Harmony module of the International Space Station at 10:03 a.m. EDT as the station flew about 252 statute miles over the California and Oregon border. The spacecraft is delivering nearly 5,000 pounds of science, hardware and supplies, including instruments to perform the first-ever DNA sequencing in space, and the first of two identical international docking adapters (IDA). The IDAs will provide a means for commercial spacecraft to dock to the station in the near future as part of NASA’s Commercial Crew Program. While the International Space Station was traveling 252 statute miles over the Great Lakes, NASA’s Expedition 48 Commander Jeff Williams and NASA Flight Engineer Kate Rubins used the station’s 57.7-foot (17.6-meter) robotic arm to reach out and capture the Dragon spacecraft at 6:56 a.m. EDT. NASA Television coverage will resume at 8:30 a.m. for Dragon installation, although it can begin earlier if operations run ahead of schedule. To join the conversation online about the cargo delivery to space station on Twitter, follow @Space_Station and the hashtag #Dragon. For more information on the SpaceX CRS-9 mission, visit: https://www.nasa.gov/spacex. For more information about the International Space Station, visit: https://www.nasa.gov/station. The SpaceX Dragon space freighter was pictured April 10, 2016, approaching the International Space Station. The SpaceX Dragon is chasing the International Space Station and the Expedition 48 crew is getting ready for its approach and capture Wednesday morning. This follows Monday evening’s rendezvous and docking of the Progress 64 resupply ship from Roscosmos. Dragon is delivering several science experiments including a DNA sequencing study and the Heart Cells investigation. The private space freighter is also carrying one of two International Docking Adapters. The adapters will enable future crewed vehicles from Boeing and SpaceX to dock to the space station. The research, hardware and other supplies stowed inside Dragon total nearly 5,000 pounds. Dragon will be robotically attached to the Harmony module after astronauts Jeff Williams and Kate Rubins capture it with the 57.7 foot long Canadarm2. This will be the second cargo mission to arrive at the station in less than two days. The Progress arrival Monday night brought more than three tons of food, fuel and supplies for the Expedition 48 crew. Progress automatically docked to the Pirs docking compartment after launching Saturday evening from Kazakhstan. Williams, Rubins and Flight Engineer Takuya Onishi prepared for the Dragon’s arrival on Tuesday and participated in a variety of research and maintenance activities. The three cosmonauts Oleg Skripochka, Alexey Ovchinin and Anatoly Ivanishin slept in Tuesday after a long day Monday preparing for the Progress delivery. The International Space Station and SpaceX Dragon flight control teams are proceeding toward rendezvous and grapple of the unpiloted Dragon cargo craft Wednesday, July 20, following Monday’s launch of the spacecraft atop a Falcon 9 rocket from Cape Canaveral Air Force Station in Florida. Capture of Dragon is scheduled at 7 a.m. EDT. Installation of the Dragon to the Earth-facing port of the Harmony module will begin several hours later. NASA Television coverage of rendezvous and grapple is scheduled for 5:30 a.m. Wednesday. Installation coverage is set to begin at 9:45 a.m. Watch live at https://www.nasa.gov/nasatv. NASA’s Expedition 48 Commander Jeff Williams and NASA Flight Engineer Kate Rubins will use the station’s 57.7-foot (17.6-meter) robotic arm to reach out and capture the Dragon spacecraft from the station’s cupola work station. 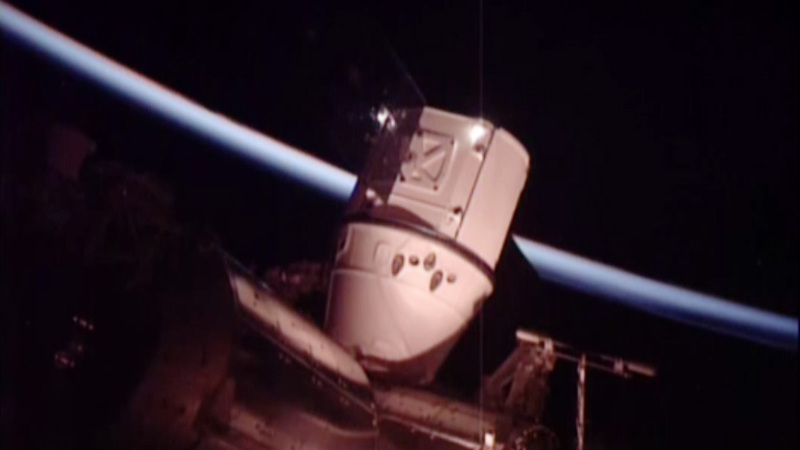 After capture, ground controllers will maneuver Dragon for its berthing to Harmony. Opening of the hatch to the Dragon is scheduled early Thursday. SpaceX CRS-9 is scheduled to deliver nearly 5,000 pounds of supplies and payloads to the station, including critical materials to directly support dozens of the more than 250 science and research investigations that will occur during Expeditions 48 and 49. Below is a rendezvous timeline – all times listed in EDT. Range < 28 km 2:21:00 a.m.
HA3 Burn (8 s, 0.37 m/s) 3:00:00 a.m.
CE3 Burn (8 s, 0.37 m/s) 3:46:00 a.m. Range < 6 km 4:01:00 a.m.
HA4 (Approach Init) Burn (6 s,0.31 m/s) 4:16:00 a.m.
350m Arrival, 180 deg Yaw mnvr 5:05:10 a.m.
NASA TV Coverage Begins 5:30:00 a.m.
Rng = 100m 5:48:30 a.m. Earliest 30m Departure (early window) 6:21:00 a.m.
Latest 30m Departure (early window) 6:25:00 a.m. Earliest 30m Departure (prime window) 6:44:56 a.m. Earliest GO for Capture (prime window) 6:46:56 a.m.
Go for Capture 6:50:00 a.m.
Latest 30m Departure (prime window) 7:37:31 a.m.
Latest GO for Capture (prime window) 8:03:31 a.m. 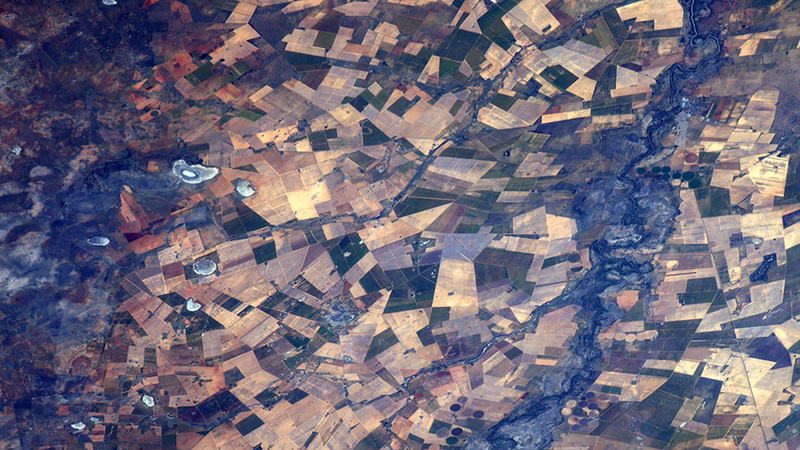 Traveling about 250 miles over Chile near the city of Santiago, the unpiloted ISS Progress 64 Russian cargo ship docked at 8:20 p.m. EDT to the Pirs Docking Compartment of the International Space Station. 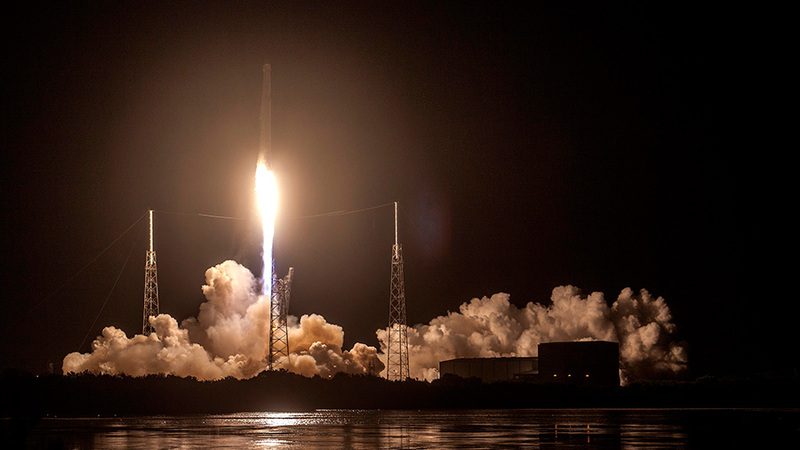 The Expedition 48 crew will now prepare for the second of two back-to-back cargo deliveries with the arrival of SpaceX’s ninth commercial resupply services mission for NASA on Wednesday, July 20. Dragon is on its way to the station with nearly 5,000 pounds of supplies and science investigations. Live coverage of the rendezvous and capture on July 20 will begin at 5:30 a.m. on NASA TV, with installation coverage set to begin at 9:45 a.m.